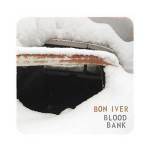 The "For Emma" LP was released a year ago... and here is a little nice follow-up EP: "Blood Bank". Bon Iver is the main project of Justin Vernon, who produces and writes the songs all by himself. The last album was pretty successful and this EP is build up around songs that couldn't be put in that album. It has a pretty positive sound. The topics are easier to understand and it's not filled with all those psychological metaphors featured in "For Emma". Songs about a love, and making babies (yes?). You won't hear a lot of instruments here, nor any virtuoso- like guitar play. The focus is simply on the simplicity. A nice little love song about a pair stuck in a car during a snow storm. Some guitar chords and Vernon's voice. And there are some sampled background vocals played by him, too. He makes use of his lapsteel guitar again, which is very nice. A typical Bon Iver song. The second song about love. I do not really like the Hawaii- sound. Nevertheless, there is nothing to complain about this one, exept it is unspectacular. Some piano chords and even the use of a keyboard. A song about the urge to ... "multiply". Well, there is something "urge-y" in this piece. Major use of a vocoder. It makes the song sound crazy. No other instruments, actually.